A quick, easy and delicious way to entertain this holiday season. 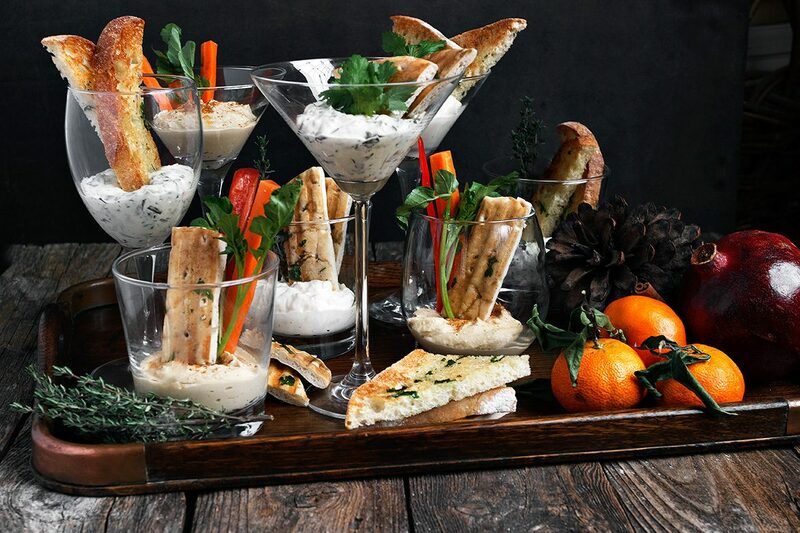 These Individual Dip Glasses are a pretty and practical way to enjoy the seasons favourite dips and hummus. Disclosure: This post is sponsored by Summer Fresh, a family-owned Canadian producer of quality, gourmet hummus, dips and salads. As always, all opinions are my own. Thanks for supporting brands that support Seasons and Suppers. 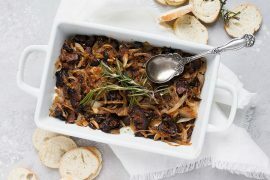 It’s such a busy time of year and if you’re like me, you’re looking for ways to offer creative and delicious food options, without spending hours and hours in the kitchen. As much as we’d like to do that, there just isn’t time for it all. Summer Fresh understands that and is here to help make your busy holiday season a little easier. 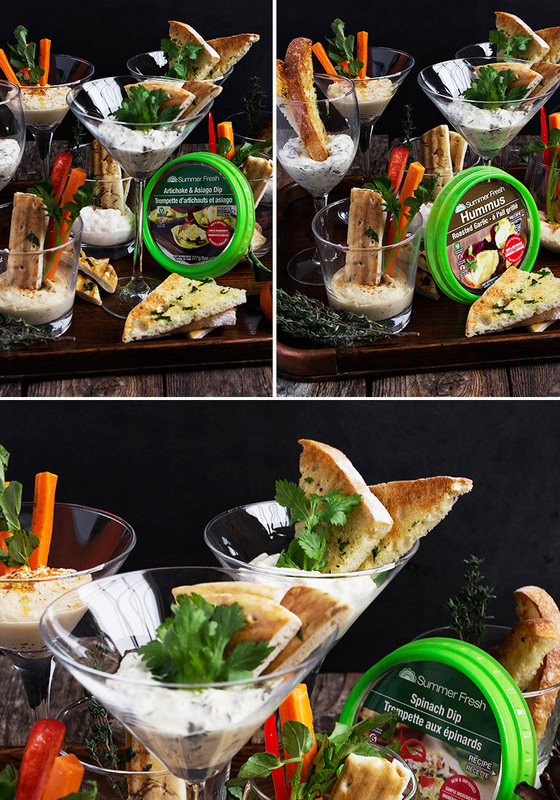 They’ve created a wide variety of gourmet dip and hummus options, made with fresh, real and simple ingredients, that you can feel good about serving to your family and friends! 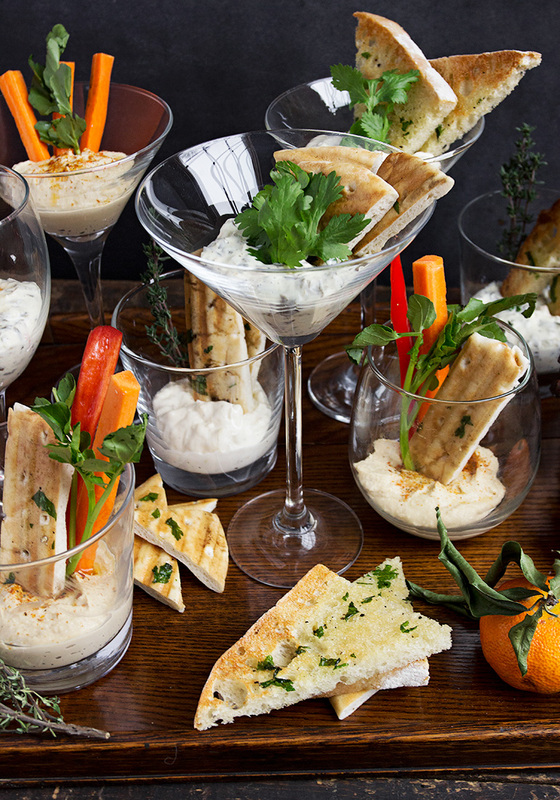 Dips and hummus are always popular for holiday entertaining. We place it in a pretty bowl, garnish it and lovingly arrange the crackers or bread around it. And 10 minutes later, it looks like a truck drove through it. And let’s not even talk about that whole double dipping thing! I thought there just had to be a better way! So I set out to create these pretty, practical and personal Individual Dip Glasses. I picked up some inexpensive glasses at my local dollar store, to supplement some I already had on hand. I looked for glasses with wide tops (like the martini glasses – just $1 each! ), to make dipping easier. Add a bit of dip or hummus to each glass. I used Summer Fresh Roasted Garlic Hummus, Artichoke and Asiago Dip and Spinach Dip, but there are many more Summer Fresh dips to chose from. Tzatziki dip would be great with cucumber and pita bread. Bruschetta dip would be lovely with garlic bread and Five Cheese would be lovely with broccoli and bread. 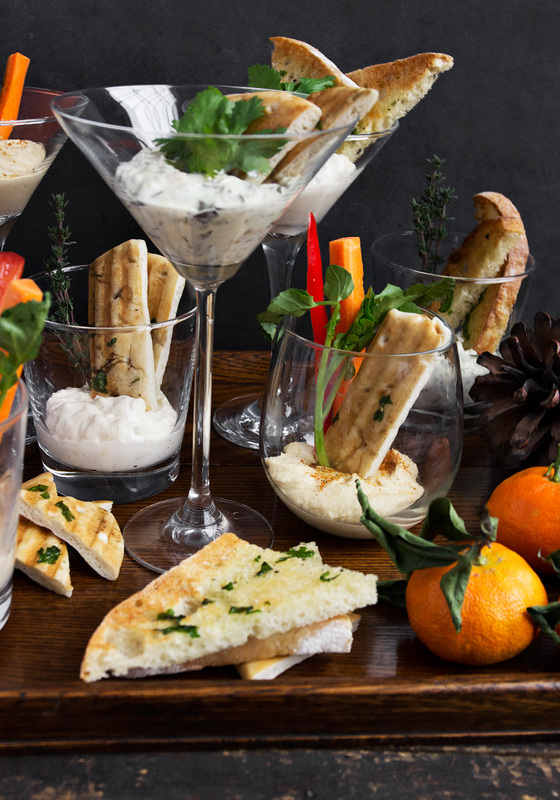 So pick a selection of your favourites and it’s easy to put together your own personal, pretty and delicious dip glasses. Add a bit of green – parsley, cilantro and watercress are all good choices. Gather up something to dip in to your dips! I used pocketless pita bread, that I quickly grilled in a grill pan and then cut in to wedges or strips. Consider the size and shape of your glasses when cutting your pita and bread. The shallow martini glasses can handle a smaller wedge, but the deeper tumblers need something a little taller. For the bread, I simply brushed slices of a nice french loaf with olive oil and a bit of fresh parsley. 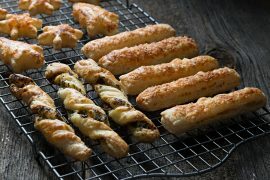 Place on a baking sheet and pop under the oven broiler until golden. Slice in to strips or diagonally. Both the pita and the bread can be done up ahead and stored in an airtight container at room temperature. Any bread, pita, flatbread or cracker would work well with these glasses. Add some vegetables – carrot sticks, celery sticks, red pepper, broccoli or cucumber sticks are all perfect for dipping and can be prepared ahead. For the roasted garlic hummus, I added a drizzle of olive oil over the hummus and a sprinkling of Harissa spice. You could also sprinkle with paprika or a bit of cayenne, if you like a bit of spice. Other ways to dress up hummus – top with toasted pine nuts, chickpeas, chopped herbs or any spice blend you like. Try a variety of hummus flavours. Summer Fresh has over 10 flavours of hummus to chose from! Place your prepared glasses on a serving tray and decorate with fruit or other holiday decorations. Place some extra pita, bread and veggie sticks on the tray, in case someone needs some extra pieces. You can learn more about Summer Fresh Hummus and Dips, as well as more entertaining ideas on the Summer Fresh website. What a beautiful, fun and easy idea that looks quite fancy! I’ve always loved individual appetizers. These are just perfect for holiday party season! 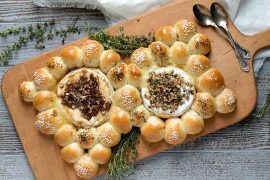 I love this dressed up appetizer idea! And from a lady that has a china cabinet full of great glasses, I know this will be on my list of must try ideas next time I have company. The dips look and sound delicious. Thanks for the party inspiration! Thanks Tricia and sounds like you are all set. It was a fun way to enjoy these delicious dips!